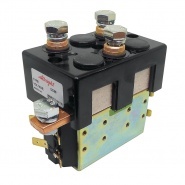 Albright International DC88 motor reversing 100A solenoids with integral brackets or without. Double acting direction contactors designed for direct current (DC) loads, particularly for motors used on small electric vehicles such as light industrial trucks, powered invalid cars, etc. All versions are available for Scheduled Maintenance or Production Run lead-time ordering. The DC88-276P 12-volt contactor has been designed for direct current loads, particularly motors as used on small electric vehicles. The DC88-499PL contactors have been designed for direct current loads, particularly motors as used on small electric vehicles. The DC88-3 series 100 amp 12 volt DC contactors are designed for direct current loads, particularly motors as used on small electric vehicles. The DC88B-3 100 amp 12 volt DC contactors with blowouts and integral mounting bracket are designed for direct current loads. 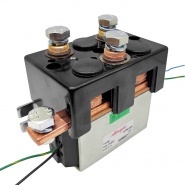 The DC88-91 series 100 amp 12 volt DC contactor without a mounting bracket is designed for direct current loads. The DC88B-91 series 100 amp 12 volt DC contactor with magnetic blowouts and without bracket is designed for direct current loads. The DC88 series of contactors has been designed for direct current loads, particularly motors as used on small electric vehicles. The DC88-538L series 100 amp 12 volt DC contactors are designed for direct current loads, particularly motors as used on small electric vehicles. The DC88-313P 12 volt contactor has been designed for direct current loads, particularly motors as used on small electric vehicles. The DC88-584PL contactors have been designed for direct current loads, particularly motors as used on small electric vehicles. The DC88-492L series 100 amp 12 volt DC contactors are designed for direct current loads, particularly motors as used on small electric vehicles. The DC88-2 series 100 amp 12 volt DC contactors are designed for direct current loads, particularly motors as used on small electric vehicles. The DC88B-2 100 amp 12 volt DC contactors with blowouts and integral mounting bracket are designed for direct current loads. 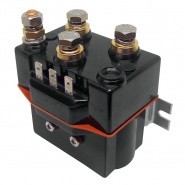 The DC88-TBC3 series 100 amp 12 volt DC contactor without a mounting bracket is designed for direct current loads. The DC88B-TBC4 series 100 amp 12 volt DC contactor with magnetic blowouts and without bracket is designed for direct current loads. 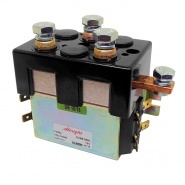 The DC88-282P 24 volt contactor has been designed for direct current loads, particularly motors as used on small electric vehicles. The DC88-556PL contactors have been designed for direct current loads, particularly motors as used on small electric vehicles. The DC88-1 series 100 amp 24 volt DC contactors are designed for direct current loads, particularly motors as used on small electric vehicles. The DC88B-1 100 amp 24 volt DC contactors with blowouts and integral mounting bracket are designed for direct current loads. 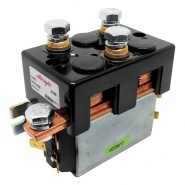 The DC88-111 series 100 amp 24 volt DC contactor without a mounting bracket is designed for direct current loads. The DC88B-111 series 100 amp 24 volt DC contactor with magnetic blowouts and without bracket is designed for direct current loads. 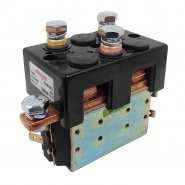 The DC88-267L series 100 amp 24 volt DC contactor without a mounting bracket is designed for direct current loads. 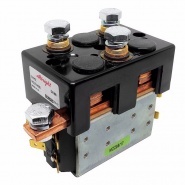 The DC88-316P 24 volt contactor has been designed for direct current loads, particularly motors as used on small electric vehicles. The DC88-389PL contactors have been designed for direct current loads, particularly motors as used on small electric vehicles. The DC88-4 series 100 amp 24 volt DC contactors are designed for direct current loads, particularly motors as used on small electric vehicles. The DC88B-4 100 amp 24 volt DC contactors with blowouts and integral mounting bracket are designed for direct current loads. The DC88-392 series 100 amp 24 volt DC contactor without a mounting bracket is designed for direct current loads. The DC88B-392 series 100 amp 24 volt DC contactor with magnetic blowouts and without bracket is designed for direct current loads. The DC88-404P 36 volt contactor has been designed for direct current loads, particularly motors as used on small electric vehicles. The DC88-5 series 100 amp 36 volt DC contactors are designed for direct current loads, particularly motors as used on small electric vehicles.